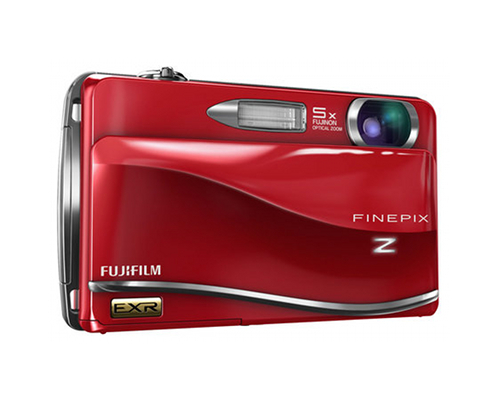 The FujiFilm FinePix Z800EXR is a touchscreen based point and shoot digicam offering a variety of features otherwise unseen on digicams, such as motion panorama 360 degree shooting and automated uploading to certain Web services, potentially making this camera more desirable to users who would take advantage of either of those two things, or to users who want one-touch shooting. The camera measures 3.9" by 2.3" by .8" and weighs 5.6 ounces with its battery and memory card included (it weighs 5 ounces without). This makes it small enough to transport in a clothes pocket without much inconvenience, much like other compact digicams. It captures images in JPEG format compressed via Exif v 2.3 and movies in AVI (captured via the motion JPEG format, with sound). It captures sound using monaural WAVE format. It can store media it takes to either its 30MB of internal memory (good for at most 4-5 shots or a few seconds of video) or SD or SDHC memory cards (good for hundreds, depending on the capacity you choose to use with your camera). The camera captures still images at a variety of resolutions, affected by the aspect ratio you choose to shoot in and whether or not you shoot images in panorama. In 4:3, the camera shoots images at 2048 by 1536, 2816 by 2112, and 4000 by 3000. In 16:9, the camera shoots at 1920 by 1080, 2816 by 1584, and 4000 by 2248. In motion panorama, the camera functions at 120 degrees, where it captures a vertical resolution of 2560 by 920 and a horizontal of 2560 by 616, 240, where it captures a vertical of 5120 by 920 and a horizontal of 5120 by 616, and at 360, where it captures a vertical of 7680 by 920 and a horizontal of 7680 by 616. The camera captures videos at resolutions of 640 by 480 or 1280 by 720. The camera includes a 5x optical zoom lens with a focal length between f=6.4 and 32mm, equivalent to a 35mm camera with a range between 35 and 175mm. Its full aperture is F3.9 in Wide and F4.7 in Telephoto. The camera also offers a 4x zoom for large and medium quality shots, which increases to 4.4x when shooting small images. The camera has an aperture of F3.9 to F6.4 shooting in Wide and F4.7 to F8.0 when shooting Telephoto. Its focus distance, in Normal, is between 2' and infinity in Wide and 3.3' and infinity in Telephoto. In Macro, this reduces to between 3.5" and 2.6' in Wide and 1.3' and 2.6' in Telephoto. The camera offers auto sensitivity with exposures equivalent to ISO 100, 200, 400, 800, 1600, and 3200, though shooting at ISO 3200 reduces the resolution considerably. The camera offers exposure control through both multimetering and TTL 256-zone metering. It offers a programmed auto exposure mode, as well as manual exposure control. Shooting modes built into the camera include Portrait, Portrait enhancer,Landscape, Sport, Night, Night(Tripod), Fireworks, Sunset, Snow, Beach, Party, Flower, Text, Dog, and Cat, with breed recognition built-in to focus dogs correctly. The camera includes a CCD-shift type image stabilizer and face detection. Exposure compensation can be set between -2 and +2 EV in 1/3 steps, and the camera has a shutter speed between 1/4 and 1/1000 of a second in automatic mode. In all other modes, the camera's shutter speed can be set between 4 seconds and 1/1000 of a second. Continuous shooting takes place at a maximum speed of 1.6 frames per second. The camera offers single autofocus and continuous autofocus modes, TTL contrast autofocus, phase detection autofocus, and frame selection to be set to Center, Multi, or Place of touch in Touch and Shoot mode, in which you point at things on the touchscreen in order to set focus. The camera includes many white balancing options, including Auto, Fine, Shade, Incandescent light, Fluorescent light 1(Daylight), Fluorescent light 2(Warm White), and Fluorescent light 3(Cool White). Its self-timer can be set to between 2 and 10 seconds and can also be set to Couple Timer, Group Timer, Auto-shutter (for animals), and Auto release. The camera has an auto super i-flash with an effective range of ISO 800. In Normal, its range is between 1' and 12.8' in Wide and 1.3' and 10.5' in Telephoto. In Macro, its range is between 1' and 2.6'. Flash modes determine the presence of red-eye and can be set to automatic, Forced Flash, Suppressed Flash, and Slow Synchro. The camera's LCD is 3.5" in size and operates at an aspect ratio of 16:9. It offers approximately 100% coverage. The camera includes a USB 2.0 port, as well as support for PictBridge compatible printers. It gets its power from a removable lithium-ion battery. The camera does not offer video output or HD video output, unlike several other Fuji digicams. The camera's zoom cannot be used when shooting video, as the noise it produces would interfere with audio capture. Accessories for the Z800EXR are limited. Fuji manufactures lithium-ion batteries, AC adapters, accompanying DC couplers, battery chargers, and an HD player which connects SD media to HD inputs.